Dalton Risner (71) has launched a foundation that aims to provide hope and inspire young people. MANHATTAN, Kan. — Dalton Risner remembers the first time he visited Camp Hope, a place where children and teens diagnosed with cancer can bond over a shared love of the outdoors, and being struck by their positive outlook in even the most dire of circumstances. 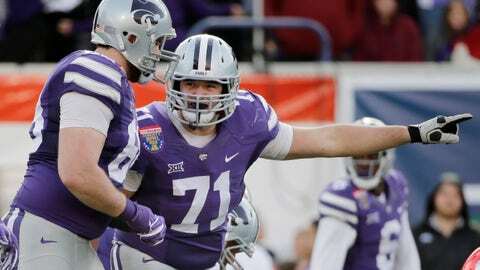 Kansas State’s star offensive lineman signed hundreds of autographs and posed for countless pictures with awe-struck kids that day, yet Risner left wishing he could have done more. Three years later, he’s hard at work fulfilling that wish. Risner started a foundation called RiseUp that seeks to share his story, faith and passions as a means of inspiring others. What started as modest print and video blogs posted online has evolved to include contributions from other young people, a busy schedule of speaking engagements and grand plans to turn the organization into a football-centric version of Camp Hope. “I want people to be able to donate money, or I can donate money, and with all that money put on camps for free for all sorts of things,” Risner said. “Maybe a camp for kids from small towns, where they might not necessarily have the experience or connections to learn football like they should. I can put on a camp for free, give out T-shirts and give them an experience. This is hardly another summer job. Then again, Risner is hardly another college football player. He arrived at Kansas State with little fanfare but had moved into the starting lineup by his sophomore season. Then, Risner was so dominant last season — despite two bum shoulders, one of which required surgery that caused him to miss the Cactus Bowl — that many talent evaluators thought he would be a first-round pick if Risner declared for the NFL draft before his senior year. “I’ve known D-Rise for a couple years now,” Kansas State wide receiver Dalton Schoen said, “and you know you’re going to get 100 percent every time, and you know he’s going to grind it out no matter how he’s feeling or what his body is going through. Once a week, Risner visits a home for children with special needs. He’s active in Big Brothers Big Sisters and has formed a special bond with a boy diagnosed with leukemia. He spends time in retirement communities, volunteers with local elementary schools and helps with the Flint Hills Breadbasket. Throw in his nascent foundation, his blogging efforts and the countless inspirational speeches he has delivered, and it’s little surprise the first-team academic All-Big 12 selection was also given the conference’s Sportsperson of the Year award last season.